Ippo is WordPress blog and portfolio theme. Lightweight, with attractive and modern design, it draws visitor’s attention to the content. Theme can be used for blogging, or portfolio theme. From December 26, 2016 Ippo is fully integrated with WooCommerce plugin. WordPress is well-known for its ease of installation. Under most circumstances, installing WordPress is a very simple process and takes less then five minutes to complete. Many web hosts now offer tools to automatically install WordPress for you. However, we strongly recommend that you install WordPress yourself, the following guide will help http://codex.WordPress.org/Installing_WordPress. Installing a theme through WordPress is quite easy and it will take only few minutes of your time. Login into WordPress admin panel, and go to Appearance -> Themes. Click on Add New button, and then Upload from the navigation bar right below it. Click on Choose File button, and browse your computer for ippo.zip file and click Install Now. After installation is complete, click on Activate link. Very important note if you bought the theme from Themeforest: Please do not upload the whole file you have downloaded. Browse for ippo.zip file inside WP directory, in the main file you have downloaded. First things first, you will need an FTP client (example FileZilla which is free, easy to use and it works on Windows, Mac and Linux) to access your web host server. Now that you have access to your WordPress installation files simply transfer your unzipped theme to your server in the ..wp-content/themes/. The only thing left to do after that is activating the theme, to do that go to your WordPress admin panel and navigate to Appearance -> Themes, search for Ippo and click Activate link right below it. Very important note if you bought the theme from Themeforest: Please do not upload the whole file you have downloaded. Browse for ippo.zip file inside WP directory, in the main file you have downloaded. For more detailed explanation on how to install themes, visit this link. Ippo theme uses latest post reading setting. 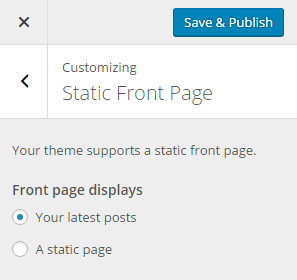 Of course, you can set theme to display desired static page, instead of posts, but you will also need to create posts page. Login into WordPress admin panel, and go to Settings -> Reading. Set Front page displays option to Your latest posts. Press Save Changes button in order to populate changes. Login into WordPress admin panel and go to Pages – > Add New. Create new page – enter title (e.g. Home). Click on Publish button in order to populate page. Now create another new page (e.g. Blog), with Default page template, using the same method. When you are done, go to Settings -> Reading. and set the theme to display static page. Then select previously create pages – for Front page select your desired page (e.g. Home), and for Posts page select your page with Default page template (e.g. Blog) . 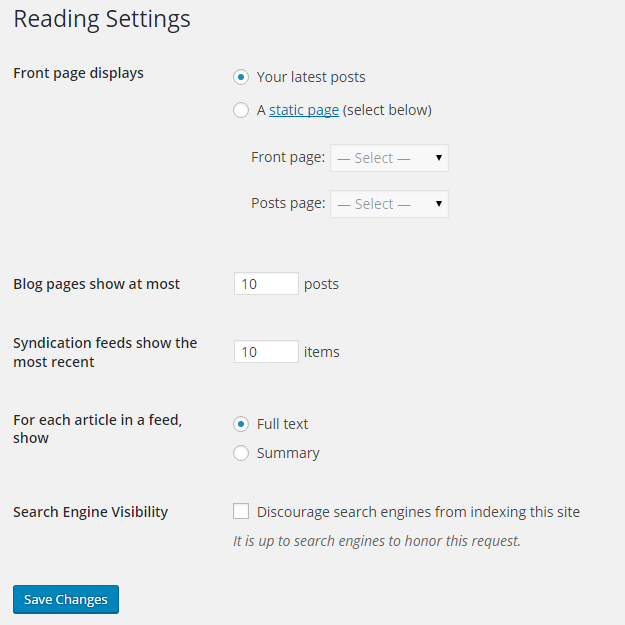 The page you select for your Post page will display all blog posts. Press Save Changes button in order to populate changes. Next important thing to do is setting your permalinks, we strongly suggest the use of pretty permalinks. Go to Setting -> Permalinks and select Post name. Ippo theme comes with extra plugins. After theme activation, you will be prompted to install and/or activate those plugins. Some plugins are required, since they adds theme functionalities. Other plugins are there to add some extra features. Flickr Badges Widget plugin allows you to display your Flickr photos in the sidebar. After activating the plugin an new widget called Wolf Flickr will be available in Appearance -> Widgets. Here you can set widget options – enter Flickr username, title, text and number of photos. Ippo Contact Form plugin will add Contact Us page template where will be displayed contact form and Google map with location marker. Instead of dealing with different sidebar areas and setting same widgets for different pages or posts, this plugin allows you to set visibility for each widget. This means that you can set which widget will appear on what page and/or post. In Appearance -> Widgets you will find that each widget now have additional button Visibility. Read more in Widgets section. Advertising Widgets adds custom post type Advertising. With advertising you can create ads and display them on site. Advertising allows you to create custom banners or to paste third-party banner code(Google Ads). Learn more about Advertising plugin. TK Shortcodes plugin will add awesome shortcodes to your theme. With them you can enrich your content and create different content layouts. Learn more about Themes Kingdom Shortcodes. General Settings: Her you can set turn on or off where social share plugin will appear – on posts, pages and on archive page. Social Settings: Easily add or remove desired sharing services. Simply drag and drop desired social networks sharing to enabled services. Display Settings: Display settings panel allows you to customize position of sharing buttons, and to select style for your sharing buttons. WooCommerce is most popular e-commerce plugin for WordPress. After plugin installation, it’s important that you go through setup process. Read first: Before importing content, please make sure to install all required plugins! Ippo theme comes with maximally simplified demo installation. This feature will install demo and set your site to look exactly like Ippo demo. 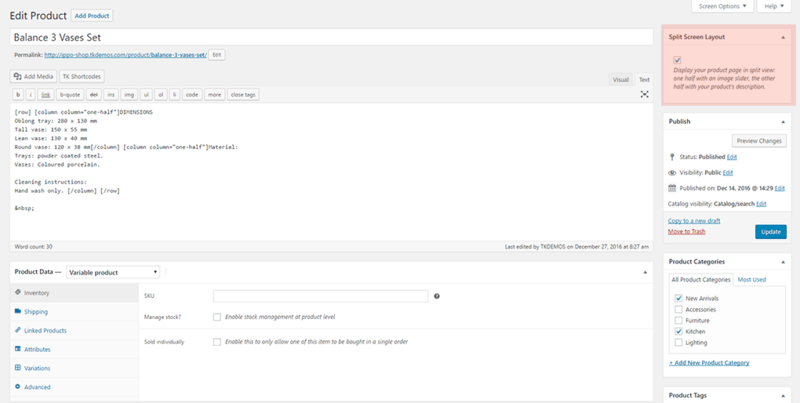 Login into WordPress admin panel and go to Appearance -> import Sample Data. First select desired demo, by clicking on it, and then click on Import Demo Data. Please note that import will take a while – lot of images and content should be imported. Note: If it happen that demo import suddenly stops, simply select same demo again, and click on Import Demo Data again. Depending from your server configuration, it might happen that you will need to do this few times. Contacting your hosting provider, and asking them to increase max_execution_time in your php.ini configuration. Add set_time_limit(240); line to your wp-config.php file. Install WP Maximum Execution Time Exceeded plugin. If you want your site to look like Eveny demo, you will need to import demo content. Go to your Themes Kingdom account and click on the XML icon to download demo file. Login into your WordPress admin panel. Click on the WordPress, install the plugin if you don’t already have it. When the plugin is opened click on the Choose File button. Select XML file you previously downloaded. Select authors to assign to posts. You may choose an existing author or create a new one. WordPress will then import each of the posts, pages, custom post types, comments, and categories contained in our demo version. Done! Very important thing to do after you are done with importing demo content is updating menus. To do that go to Appearance -> Menus. Select desired menu and under the Menu Settings at the bottom of the page check Primary Menu, then click Save Menu button to save changes. For more detailed explanation how to Import demo content, visit this link. 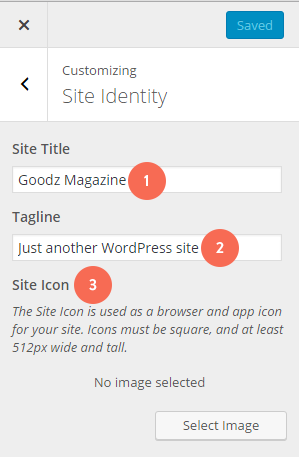 Site Identity allows you to set your site title, tagline and icon. Site title is the name of your site and it’s displayed in the header, where logo is displayed. Tagline is short description, or your motto, and it’s displayed just under the title. This setting is the same as in Settings -> General in WordPress admin panel. Site title: Name of your site. Background Image allows you to upload image that will be used as background image instead of solid color. Background Image: Upload your background image. JPG, PNG and GIF formats are supported. Tile: Image will be repeated by default, starting from top left corner. Tile Horizontally: Image will be repeated horizontally, starting from top left corner. Tile Vertically: Image will be repeated vertically, starting from top left corner. Background Position: Defines where and how background should be placed. You should use Center if you are using large, one piece background. Background Attachment: Defines if background image will have fixed position, and always visible to the user, or it will scroll as user scrolls through the site. This option allows you to quick manage created menus. You can select which created menu will be displayed as Primary Menu or Social Menu. If you need to manage actual menu items, you can do that in Appearance -> Menu. Widgets section allows you to quickly manage widgets in widget areas. 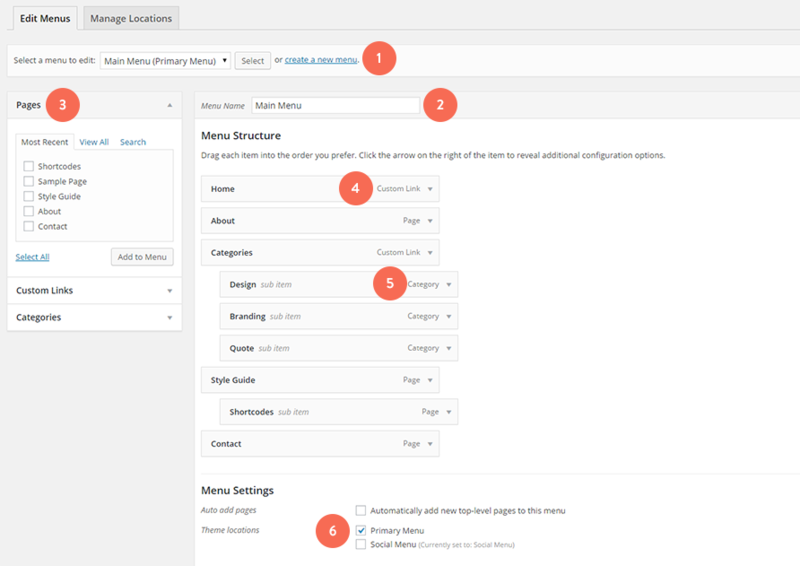 This option allows you the same possibility as Widgets option in WordPress admin panel. This option works the same way as Settings -> Reading. It allows you to set them to read latest post or to use static pages for landing and blog page. Ippo theme allows you to set font family and font weight for headings, paragraphs, and navigation elements. 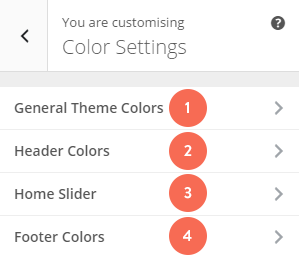 Colors panel allows you to set color for some elements in the theme. Header Colors: Color of main navigation elements and header navigation background color. Home Slider: Slider navigation and text colors. Footer Colors: Footer background, link and text colors. 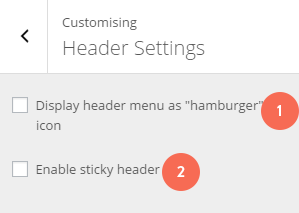 Header settings option allows you to manage how navigation will be displayed, and to enable or disable fixed header(“sticky” header). 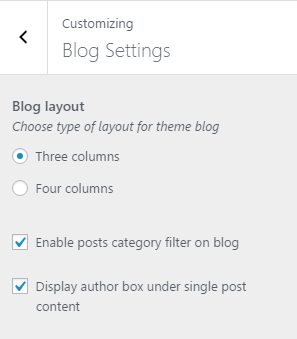 In Blog Settings you can set layout options for blog page. Blog layout: Blog layout can be displayed in three or four columns. On mobile devices, number of columns will be lower, in order to make reading easy, and content accessible. Enable posts category filter on blog: Check if you wish to display categories based filter on posts page. Display author box under single post content: If enabled, author box will be displayed under the content on the single post page. 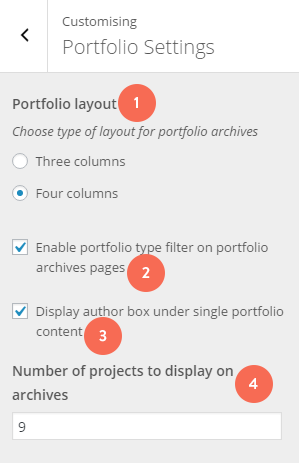 Portfolio settings are used to manage number of columns, filtering and enable/disable author box on portfolio pages. Please note that Ippo Custom Post types plugin should be installed and activated. Portfolio layout: Portfolio layout can be displayed in three or four columns. Enable portfolio type filter on portfolio archives pages: If enabled, active filter with portfolio categories will be displayed above the portfolio posts. Display author box under single portfolio content: If enabled, box with author info will be displayed under single portfolio content. Number of projects to display on archives: How many projects will be displayed on portfolio page. 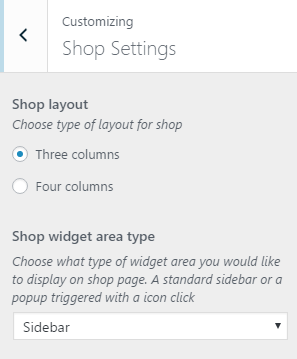 Shop settings contain layout settings for shop page. Shop layout: Shop products can be displayed in three or four columns. 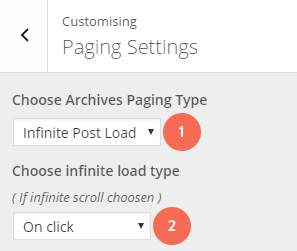 In Pagging Settings section you can set what paging will be used – classic or infinite scroll, and to set how infinite scroll will load posts. Choose Archives Paging Type: Select what paging will be used – classic, or infinite scroll. Choose infinite load type: For infinite loading you can set loading on click or on scroll. Check to enable Slider on front page: If checked, slider will be displayed on the homepage. 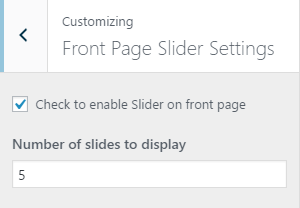 Number of slides to display: Set number of slides to display on the homepage. Footer settings contain two options which allows you to set footer Instagram and copyright text. In Ippo theme you can display Instagram feed in the footer. Instagram feed will be displayed as horizontal list. 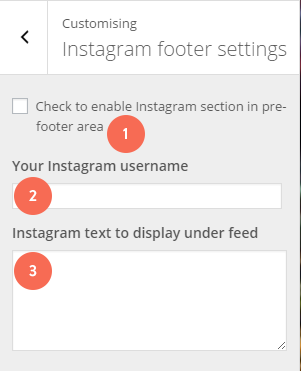 Check to enable Instagram section in pre-footer area: If enabled, Instagram feed will be displayed above the footer. Your Instagram username: Enter just your Instagram username (e.g. themeskingdom). Instagram text to display under feed: Short text that will be displayed under the feed. Enter desired copyright text. If this field is empty, default text will be displayed. 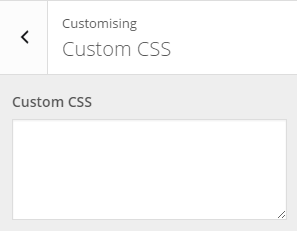 In custom CSS section you can enter your custom classes, so you don’t need to mess with original styles, or create child theme. Of course, you should create child theme if you plan to modify other files as well. 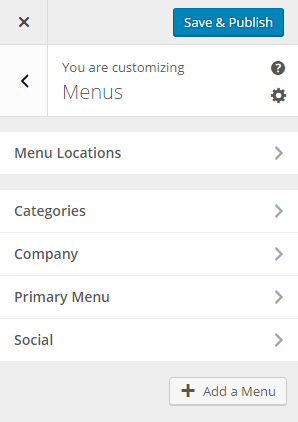 Ippo theme comes with one default menu location – primary menu, and social menu. The Primary menu is located in theme’s header area. This menu can contain custom links, pages, categories, tags, or posts. Social menu is used to display links to the social profiles. Login into WordPress admin panel and go to Appearance -> Menus. Click on Create a new menu link. Enter name for your menu(e.g. Primary), and press Create Menu button. Your new menu is created. Now you can add your pages, posts, categories, tags and links to the menu. When you are done check option Primary Menu and press Save Menu button. Click on “create new menu” to add new menu. Here you should define a name for your menu, after that click on the Create Menu button right next to it. Select pages you want to add to your menu. When you are done with selecting pages, click on Add to menu button below. You can also add custom links, posts, categories etc. as you can see in the panels below. This menu editor allows you to create multi-level menus. To do that simply hold your left mouse button and drag desired menu items left or right. Dragging menu items slightly to the right will make them sub-menus for the menu item that is above them. You can also change the order of appearance of menu items by dragging them up or down. Remember to save the changes when you are done with editing (No4). Set “Primary Menu” check box to checked if you want this to be your primary menu. Login into your WordPpress admin panel and navigate to Appearance -> Widgets. Choose a widget you would like to use, and drag it into the sidebar to right (shown in No 3). Widgets will become active after a page refresh. Widget area where you place desired widgets. You can add, remove or customize widgets in widget areas. To do that click on the arrow icon in the top right corner of the widget box to expand it. You can also change the order of appearance by simply dragging widgets up and down. Ippo theme have four widget areas – default sidebar, and three footer widget areas. If you have installed Widget Visibility plugin that is bundled with the theme, you will be able to set widget visibility depending from post or page. Visibility works in simple if or if not logic. This means that you can set widget to be visible if some condition is, or if it’s not matched. Widget visibility options will be displayed as part of the widget. Show widget only on contact page: Select from dropdown Show only, and then from list check box near your contact page. Save changes. This way widget will be displayed only on contact page. Hide widget only on contact page: Select from dropdown Hide, and then from list check box near your contact page. Save changes. This way widget will be hidden only on contact page. Advertising widget allows you to display ads in sidebars and footer, in order to use this widget you will have to install TK Advertising Widget plugin. You can find out how to add new ads in chapter Advertising. Select Ad: Select ad you want to show. Ad size: Ads can be shown in “fullwidth” or “halfwidth”. Size is calculated based on widget area width. Bottom margin: Spacing between bottom of the ad and the next widget. Value is in pixels. Top margin: Spacing between top of the ad and the next widget. Value is in pixels. Flickr widget allows you to display images from Flickr, in order to use this widget you will have to install Flickr Badges Widget plugin. Type: The type of images from user or group. Insert Flickr ID: Instructions how to get Flickr ID: http://zourbuth.com/tools/flickr-nsid/ . Number: Insert number of images you want to be displayed in the widget. Display Method: You can set widget to display latest or random images. Sizes: Set size for displayed images. It can be standard, thumbnail and medium. Show Copyright: Show widget copyright with link on the front page. Facebook widget allows you to place URL to your Facebook page. After you add Facebook page URL, Facebook like box will appear in desired widget area. Make sure that you are using your page full URL (example https://www.facebook.com/themeskingdom). Newsletter widget works with two services – MadMimi and MailChimp. Both MadMimi and MailChimp will require that you to have an active account. For detailed instructions how to set MadMimi or MailChimp accounts, please check this link. Twitter widget will display desired number of latest Tweets. It requires you to have Twitter account and Twitter API key. You can find all the instructions how to setup Twitter here. Title: Title that will be displayed above the tweets. Consumer key: Key that you have generated in Twitter API setup. Details how to generate API keys can be found here. Consumer Secret: Equivalent to your Twitter password. Details how to generate API keys can be found here. Access Token: Twitter API token. Details how to generate API keys can be found here. Access Token Secret: Twitter API token password. Details how to generate API keys can be found here. 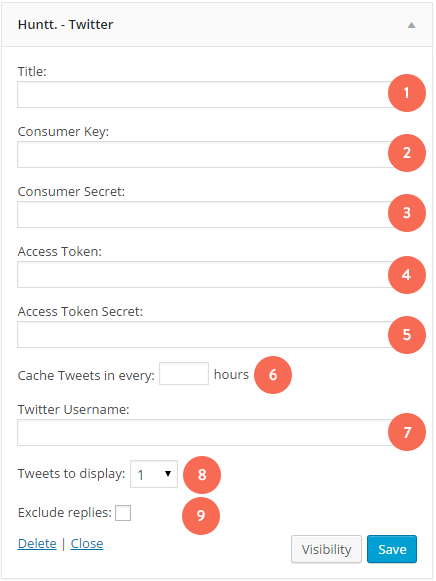 Cache Tweets: Twitter caching option that allows you to set how often tweets will be obtained. This option should speed up site, and reduce chance that you will hit Twitter API calls quota. Usual value is between 2 – 4 hours. Tweets to display: Number of tweets that will be displayed. Exclude replies: Check this option if you don’t wish to display replies to your tweets. Instagram feed widget will display images from desired Instagram account. Title: Title for your Instagram feed widgets. Username: Instagram username from which will be displayed images. Number of photos: Number of photos that will be displayed in the feed. Open links in: Where links will be opened – in the same tab or in the new one. 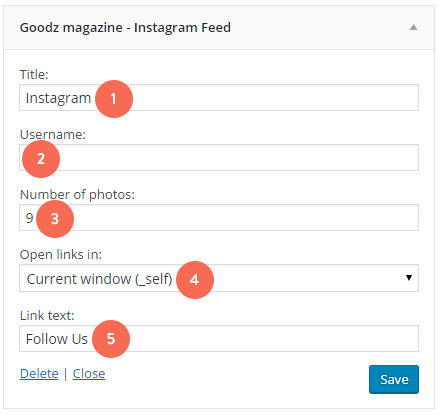 Link text: Text that will appear for Instagram profile link. Ippo theme comes with several different post formats: Standard, Gallery, Video, Quote and Link. Post title: Name of your post. It will be displayed on the front end. Post content: Content of your post – text, images, shortcodes and other. Publish: Publish options. You can set custom date and time for publishing your post, and set post status – draft, in review or published. Category: Each post in WordPress is filed under one or more categories. This aids in navigation and allows posts to be grouped with others of similar content. Tags: Tags are words that allows you to organize posts by similar content. Set featured image: Featured image will be used as cover image on front end. Standard post format is the most common format, and it can be used for different purposes. In Standard post format, featured image will be displayed above the title and post content. Gallery post format allows you to set several images which will be displayed as slideshow on the single post page. After selection Gallery format, additional Gallery Fields will be displayed. You can add additional Gallery images fileds, so you can upload desired images. Featured image will be used as cover image on the front page, while additional images will be displayed as slideshow on single post page. Video post format allows you to easily add video to your post. After selecting Video format, additional Video Options panel will be displayed below editor area. Here you can paste URL to your video (e.g. YouTube, Vimeo…). Player with your video will be displayed above the post title and content. Quote post format is great way to display different thoughts. After selecting quote Quote post format, two additional fields for quote text and quote author will be displayed below the editor. On the front end, featured image will be displayed above the quote text and quote author. Featured image and text will be displayed on black background, so quote and image will look like poster. With Link post format you can create cool looking links to interesting Internet locations. After selecting quote Link post format, two additional fields for link text and link URL will be displayed below the editor. On the front end, featured image will be displayed above the quote text and quote author. Link post format will display featured image above the post title and link text. Featured image and text will be displayed on white background. “Sticky” posts are displayed at the top of other posts. 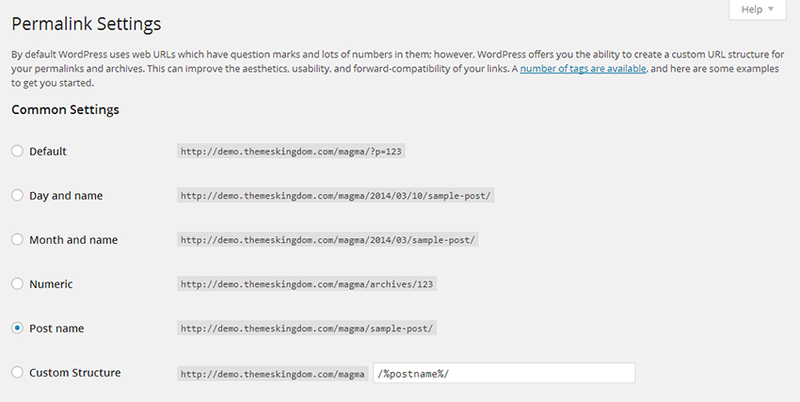 To create “sticky” post, login into WordPress admin panel and go to Posts -> All Posts. Find post that you wish to make “sticky”, and click on Quick Edit link under it. Check “Make this post sticky” box, and click Update button to save changes. Spotlight post is featured post that is displayed twice of it’s size. Spotlight post can be any post. If you need, you can combine sticky and spotlight posts. 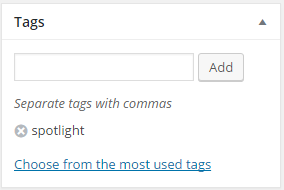 To create spotlight post, simply add Tag “spotlight” to your post, and save changes. Pages are for content such as About, Contact, etc. Pages live outside of the normal blog chronology, and are often used to present timeless information about yourself or your site — information that is always applicable. You can use Pages to organize and manage any content. Ippo theme uses two different page templates to display different information. Included page templates: Default Templates and Contact Us. Default Template – Default Template is multipurpose page template, without any special property. Contact Us – Contact Us page template is used to display map and contact form. Primary is used to display contact information. If you need to set custom email address where email will be sent, you can do that in The Customizer -> Contact. Headline Template – If you don’t wish to use the slider, but you need to display some static text or content above blog posts, then you should use this page template. Portfolio Template – On page with Portfolio Template will be displayed all Portfolio items. 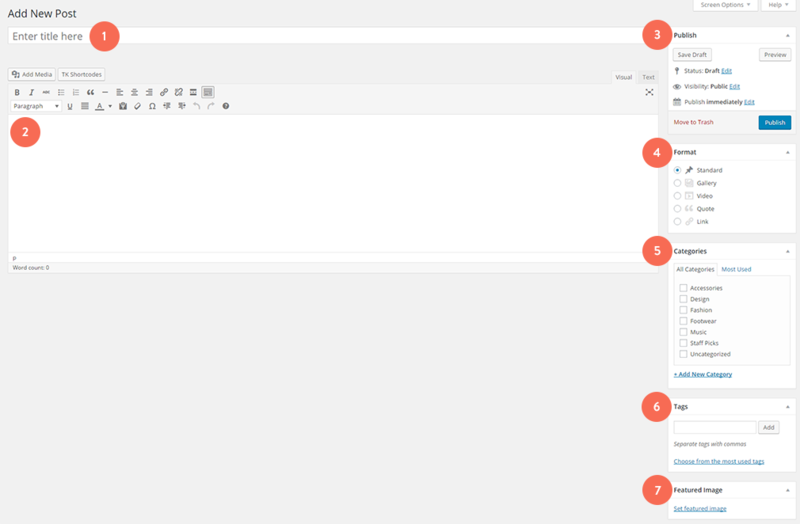 Portfolio is custom post type, that comes with Ippo Custom Post Types plugin. Portfolio(or Projects) are used to display your work on page with Portfolio Tempalate. Portfolio items can be associated with Portfolio categories. Project name: Enter your project name. Project content: Content of your project – text, images, shortcodes and other. Publish: Publish options. You can set custom date and time for publishing your project, and set project status – draft, in review or published. Category: Each project can be filed under one or more categories. This aids in navigation and allows projects to be grouped with others of similar content. Advertising post type allows you to create ads that will be displayed in Advertising Widget. This widget can be placed in footer, custom sidebar or default sidebar. In order for this custom post type to be displayed in your admin make sure to install TK Advertising Widget Plugin. You can find additional information regarding this plugin in Included plugins section. Ad view / click statistics. Blue line represents number of views and while red represents number of clicks. Advertisement link: Link where advertisement is pointing. You should enter full URL (http://www.example.com). Custom banner code. Here is a guide how to get Google AdSense code. Once you click update/publish, your ad will be available in Advertising Widget. Featured image will be used as advertisement image. You can find more information how to use Advertising Widget in Advertising Widget section. When adding new product, you have option to display product in Split Screen Layout. 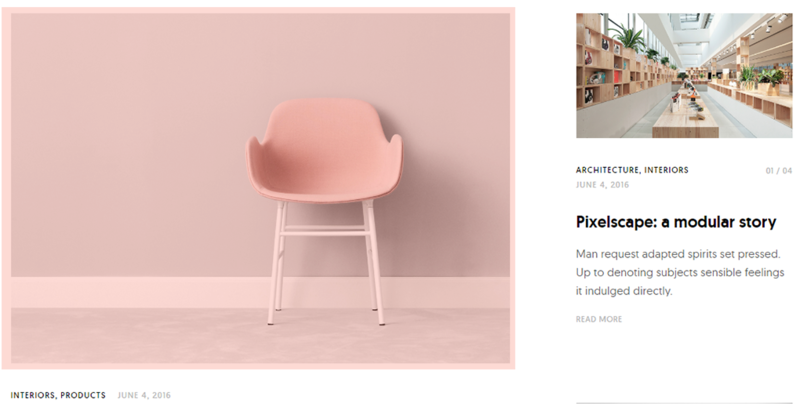 If Split Screen Layout is enabled, product image(s) will take cover left half of the screen from top to bottom, while description will be displayed on the right. Split Screen Layout box is displayed in product edit mode. Split screen layout is not available for variable products, only for simple products. If you need additional assistance for this theme, please submit a ticket in our support system.